The harvest moon shines, the winter wheat is gathered and the turning leaves crunch at our feet for one of these legend's best offerings since 1978's 'Heavy Horses'. More than a Christmas album, it is a celebration of the season, an embrace of the bite of cold in the air and the need for all living things to reflect the equinox with a sense of joy, the crackle of a fire and a stiff shot of brandy to warm the bones and lift the spirits. Ian Anderson's flutter introduces 'Birthday Card at Christmas', Marty Barre's electric bits & pieces accentuating Anderson's acoustic guitar in a wink to the Baby Jesus. 'Holly Herald' tributes 'Hark! The Herald Angels Sing', Charles Wesley's classic carol from 1739 revived with Celtic war drums and a taste for salt in the air, and two 'Christmas Songs' featuring Ian's mandolin, a concertina, the shake of bells and much sentiment. No one brings to life the ancient sounds of the British Isles like this ageless band, and 1833's 'God Rest Ye Merry, Gentlemen' is given a cool jazz treatment topped by some heavy metal and neat little Baroque flurries. 'Jack Frost and the Hooded Crow' is a traditional folk number, Ian's baritone harmonies in top form, and the innocent and funny 'Last Man at the Party' with more Gaelic warmth is followed by a charming and strong re-recording of 'Weathercock' from the Horses period. A lovely version of Faure's 'Pavane', bittersweet memories of America in the gentle 'First Snow on Brooklyn', an upbeat 'Greensleeves', perfect 'Fire at Midnight', 'We Five Kings' puts the band in the Bethlehem desert with a bit of Marty's Spanish guitar, an obligatory 'Ring Out Solstice Bells', Bach's 'Bouree' is revisited and Barre finishes out with a steel string moment to himself. 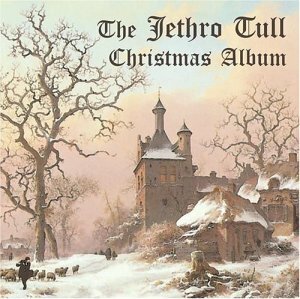 A salutation of the special place these musicians have in music and in our hearts, Tull's Christmas Album is a beautiful record to be held close and protected from the jeers of the Grinches that surround us. Merry Christmas to all, and to all a good night.